There are no current exhibits. Please check back for upcoming exhibits. 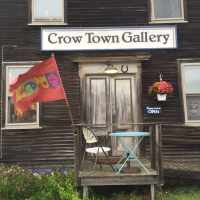 Shanna purchased long-established Crow Town Gallery in Lubec where she had been a resident artist three summers previous. Former owners Bonnie and Ukey laid the foundation with emphasis on community which Shanna wishes to continue. One year later, things are finally feeling settled. The 2018 season included live concerts produced by Cobscook Bay Music, a raku-firing event open to the public, and a holiday artisan market featuring local talent. There are lots of great things in the works for 2019! Shanna Wheelock received the Maine Arts Commission Artist Fellowship/2017 Belvedere Handcraft Award, one of seven individual artist fellowships awarded this year. This merit-based award is primarily informed by an applicant's body of work and serves to acknowledges artistic excellence and advance the careers of Maine artists. Shanna kicked off 2017 with an artist residency at the American International School of Zagreb where she taught ceramics to students in grades Pk-12 during their Arts festival. 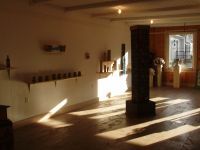 Students who hailed from coutnries all over the globe tried their hands at the potter's wheel, learned handbuilding, and etched using sgraffito techniques. Shanna has created awards for the Bay of Fundy International Marathon for six years running! The 2018 award theme was the periwinkle. Past award themes include the Herring, North Atlantic Right Whale, Harbor Seal, Sea Scallop, and the starfish Stay tuned to see what the 2019 theme will be! Read an article about the 2013 awards in the Bangor Daily News by clicking here. View images of Wheelock's Lubec Landmarks installation "Razed", a seven foot ceramic sculpture commemorating Lubec's lost factory industry. It is important that we keep compassion at the forefront of decisions.